Clint Eastwood has played so many grumpy old men pissed off at young people that it's basically become a genre. Much like Liam Neeson as the angriest lost property officer in the world, or Nicholas Cage as Hell's mercenary defying the forces of evil, it seems like Eastwood has found the one role that corresponds to his self-image in recent years and has decided to play it til he's dead. Which won't be long if he keeps stressing himself out with irritatingly precocious youths like Amy Adams and Justin Timberlake in 'Trouble With The Curve'. Eastwood's curmudgeonly baseball scout, Gus, has no time for your damn shenanigans, until poor health necessitates his estranged daughter joining his scouting trip. In between failing to bond with each other, they separately bond with Timberlake's smarmy, ingratiating Johnny, a rival scout. Through a mess of intertwining plots, all fairly simple but all getting in each others’ way, everyone discovers something about themselves and the value of whatever. Like most sports movies, this has nothing to do with sports - baseball is merely a backdrop on which the drama is played out. This still might be enough to deter most British viewers though. The UK doesn't really get baseball, the most common question dismissively hurled at baseball fans here being "Isn't it just rounders?" (Yes, but they throw the ball at 100mph. That kinda changes things.) If you are going to be put off by anything, I'd hope it's more to do with Eastwood's self-imposed typecasting, or Timberlake's oleaginous attempts at charm. Of course, the upside of that criticism is that all the actors nail their parts. Behind the camera, everything is similarly nailed with a total lack of invention. Director Robert Lorenz has spent the last decade 1AD-ing for Eastwood, and it shows - he brings a lucid competency to the film and absolutely nothing more. The writing is flat but gets the job done, congratulations Randy Brown. ‘Music?’ What music? So undisguised and passionless is every narrative device and emotional cue that 'Trouble With The Curve' comes across as a paint-by-numbers script languidly filled in with crayons. If you’re someone who needs to see every Clint Eastwood film, then I admire the dedication to a cinema giant, but it won’t be rewarded here. Expect no blessings beyond the mildness of the day. 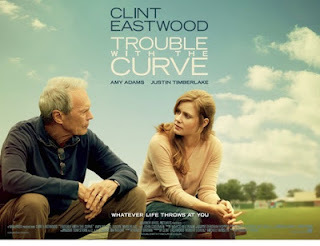 'Trouble With The Curve' is out on DVD and Blu-ray, and is available to purchase at amazon.co.uk.